Fully integrated extra care housing development fell by a quarter last year on its 2015 peak, according to consultant Kingsbury Hill Fox. The Extra Care, Assisted Living & Retirement Communities market report said the sharp drop was driven by a 33% decline in new units for letting due to the capping of rents at local housing levels. “This threat was brought home to me when a housing association client asked me to advise on the potential of selling leaseholds in a nearly-completed extra care scheme,” said author of the report, Philip Mickelborough. The report predicts the rate of development to rapidly exceed 2015 levels, however, following recent changes to legislation. 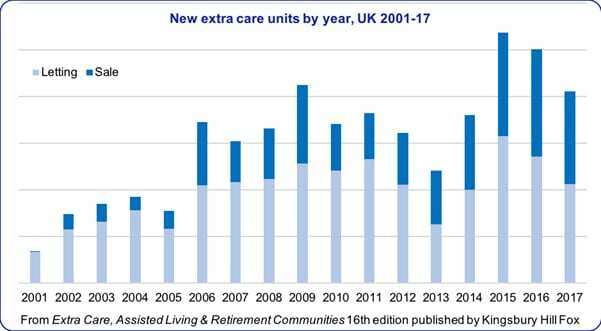 With most housing association extra care schemes being mixed-tenure, the report says putting schemes on-hold also caused an 11% drop in new units for private leasehold sale. “This private market is itself developing rapidly, with the hitherto neglected mid-market leasehold sector now being met by distinct brands aimed at that those purchasers,” Kingsbury Hill Fox said. The consultant added that several developers were addressing the potential for top-end luxury care schemes in central and suburban London. Extra care has been a growing market, with the personal care alone in England being worth over £750 million in 2017 and the whole market worth well over £2 billion.